Adaptive radiation is the evolutionary process whereby a single ancestor can rapidly diverge into a wide variety of species according to different environmental conditions. It is a poorly understood process due to a lack of information on the critical early stage of divergence. Here, Darko Cotoras describes research published in BMC Evolutionary Biology performed by himself and colleagues that provides a missing link in the process of adaptive radiation. Remote island archipelagos have long inspired scientists. They provide an opportunity to integrate ecological and evolutionary processes, advancing our understanding of the processes shaping biodiversity. The Hawaiian Islands are the home of some of the most spectacular events of massive diversification. This is particularly true when the component islands are arranged chronologically, as is found in “hotspot” islands that form a geological age gradient representing snapshots of biodiversity assembly through evolutionary time. Such islands provide simple and discrete systems, of known age and varying area, allowing them to serve as excellent “natural laboratories” for understanding the evolution of life under supreme isolation. The Hawaiian Islands in particular are the home of some of the most spectacular events of massive diversification. More than a thousand species of Drosphila fruit files, tens of Honeycreepers and a vast variety of lobelioids plants, just to mention a few. All of them are examples of adaptive radiation. Adaptive radiation is the evolutionary process by which a single ancestor can rapidly give rise to many species that diversify along different ecological axes. But, how does it happen? While many studies have examined the rate of diversification and patterns of ecological shifts, the missing element has always been the initial steps: How does a single species diverge ecologically in a way that allows it to co-occur in exactly the same site as its parent species? In a recently published paper at BMC Evolutionary Biology we examined this question by analyzing the population genetics of closely related species from an adaptive radiation of Hawaiian spiders in the long jawed genus Tetragnatha. Different species in this genus have been characterized by their color – whether Green, Maroon, Small Brown or Large Brown – and the substrates upon which they find refuge during the day (green leaves versus maroon mosses, brown twigs, or branches). 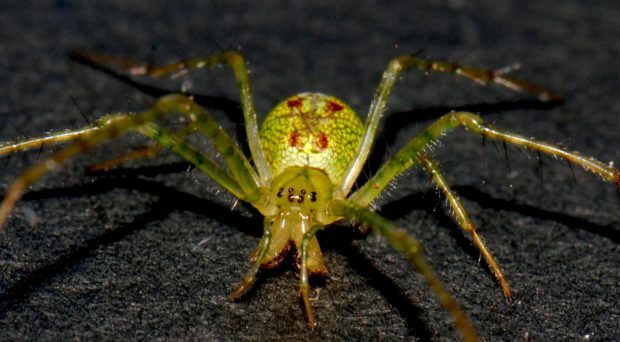 Given the exclusively nocturnal behavior of the spiders and their very limited visual capacity, diurnal predation is the most likely selective pressure responsible for the close color matching. The most likely predators are honeycreepers for which spiders can form an important component of the diet. Within the radiation, species have tended to colonize from older to younger islands and ecomorphs have arisen partly through in situ diversification producing closely related species of different ecomorph; and between-island colonization in which species pre-adapted to each of the niches arrive from older islands and subsequently differentiate in allopatry without change in ecomorph. The specific question we asked was, given that populations likely start diverging in allopatry without any change in ecomorph, at what stage do they come back together and interact in sympatry? By focusing on close relatives of species of the same ecomorph that occur on the youngest islands of the Hawaiian chain, we were able to elucidate the initial stages of the process of adaptive radiation. Major results were, first, that populations of the same species are highly structured, indicating that the first axis of separation between populations is likely allopatric. Second, we found that, within the focal set of taxa, genetically divergent lineages co-occur without evidence of hybridization. This situation suggests that these genetically divergent lineages had already developed reproductive isolation when they came into secondary contact, yet this occurred prior to ecological divergence. This contrasts what we find on older islands, where sister species are ecologically different (separate ecomorphs). Therefore, this study highlights a key period in the process of adaptive radiation when divergent and genetically separated taxa within the same ecomorph have the opportunity to interact. Acknowledgements: This blog post was reviewed and improved by Rosemary Gillespie, the senior author of the referenced publication. Darko D. Cotoras is an evolutionary biologist interested in the historical processes that create biodiversity, particularly looking at oceanic islands. He combines field surveys with museum work in order to gather material for phylogenetics, population genetics and genome assembly. Currently, he is a Research Associate at the California Academy of Sciences and previously did a PostDoc between the same institution and the University of California, Santa Cruz. His PhD is from the Integrative Biology dept. at the University of California, Berkeley. While his Master in Ecology and Evolution, and Bachelors in Biology are from the Universidad de Chile.